French presidential front-runner Emmanuel Macron is captured at the age of 15 on camera kissing his drama teacher - the woman, aged 40, who would later become his wife. years Macron's senior - and was married with three children when he was in high school. Despite this, the far-left candidate was not put off, and was just 16 years old when he vowed to marry her . Macron had been appearing in a school play in May 1993 with his classmates when he came off stage and was congratulated by his teacher, alongside the other actors.After a handshake and a kiss from Ms Trogneux, he then grabs the microphone and appears to grin cheekily in her direction, although it is not clear what is said. The pair went on to marry in 1997. The unusual love story has captivated French tabloids and magazines, and emerged as a major storyline during Macron's rapid rise towards the Elysee Palace, with both husband and wife hitting back at critics. Macron, who quit the Socialist Party to run for president and founded the party En Marche! in April last year, has repeatedly paid tribute to his wife and told his supporters she would play a major role as France's first lady if he's elected. 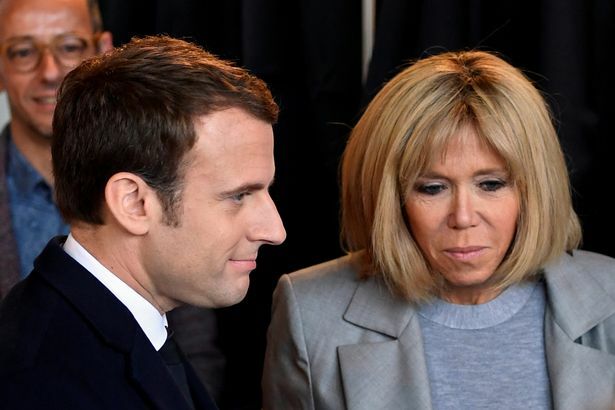 The May-December romance blossomed as Trogneux taught Macron when he was a 15-year-old student at a Jesuit college in Amiens. A new book says he defied orders from his parents to end the romance and his father ordered Trogneux to stay away from his son until he reached 18. At 16, Macron's parents sent him to Paris to continue his studies but he vowed to marry Trogneux, who was around 40. Trogneux told the documentary: “We’d call each other all the time and spend hours on the phone.